An excerpt with from the book "Norway"
Skirting the Trondheim Fjord as one returns to the southern third of Norway, a more agricultural atmosphere pervades. Fields near Trondheim lie across mildly undulating terrain and look luxuriously spacious compared with farm plots elsewhere. 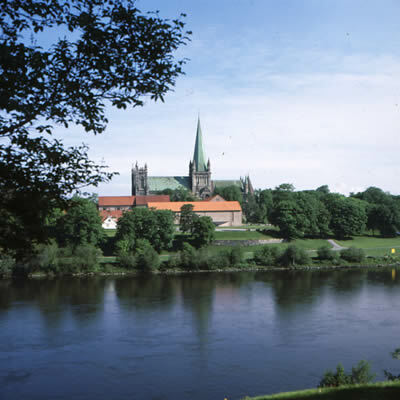 Nidaros Cathedral in Trondheim, dating from the fourteenth century, is the largest church building in Scandinavia. Seven kings and three queens have been crowned here, the last being King Haakon VII who became king in 1905. A decision of Parliament altered the tradition, so when Olav V succeeded his father in 1957, he was not crowned, but was blessed in a religious ceremony. Trondheim is the northern gateway to the largest inland section of the country, and area of mountains, viddas, and rolling agricultural land. Although so much of Norway is near the sea, half of its area is more than one thousand feet above sea level, and one-fourth is more than two thousand feet in elevation. The proximity of the sea and the fact that at this latitude the timberline is approximately three thousand feet make even a seemingly modest mountain elevation truly impressive. The mountain ranges run generally from north to south, with the highest of them toward the west. Great, rolling plateaus are broken by thrusting peaks and long, deep valleys. Dovrefjell, the mountain area just south of Trondheim, is a non-glacial formation, which is one of the country’s driest areas. Snøhetta, its highest peak at seventy-two hundred feet, keeps its majestic watch over the main north-south highway, which bisects a wind-swept, barren plateau. Traditionally, the girls of a farm family would take cattle, sheep, or goats to a highland pasture each summer. One of Ole Bull’s most evocative compositions describes such a girl, homesick on a Sunday morning as she hears church bells in the valley. Such a place is Elveseter, in the uplands between Dovrefjell and Jotunheimen. Its name tells the story, for elve means river, and seter means highland pasture. South and west of Dovrefjell lie the three great highland plateaus that give the southern third of Norway much of its special character. Toward the sea lies Jotunheimen, or “land of the giants”, the largest massif in Europe north of the Alps. It boasts the highest peaks on the Scandinavian Peninsula, the king of which is Galdhøpiggen at 8,087 feet. Jotunheimen is a skier and hiker’s paradise and through the years has been the inspiration for folklore about giants and trolls inhabiting its far mountain reaches. On its seaward side, it drops through deep valleys aroar with cascades, on the fjords and the sea yet four to five feet of snow often remain along the roads, even in the summer. Near Trollstigveien-a spectacular, steep highway of switchbacks-it is quite common in June to see skiers negotiating the slopes in swimsuits. Jostedalsbreen attains a height of seven thousand feet in some places and is the largest glacier in Europe. While this 340-square-mile ice field is the largest, it is simply one of many that dot the upper elevations, for glaciers make up 1 ½ percent of the total land area of the country. This pastoral scene at Grindheimsdal near the Hardanger Fjord illustrates the variety of Norway’s terrain. Almost two-thirds of the country is mountains and moors. In addition to the many fjords, fresh-water lakes and rivers make up nearly 5 percent of the total area. Some of the glacial lakes---long, narrow, and fjordlike in appearance---are called fjords even though they are actually bodies of fresh water. East of the mountain plateaus lies the most densely populated part of Norway. Foothills and valleys, thick with evergreens, are bisected by a maze of streams and dotted with lakes. In contrast to the cook, wet summers and relatively mild winters along the coast, here the weather contrasts are more extreme. Nesbyen in Hallingdal holds Norway’s heat record of 97 degrees Fahrenheit. With true inland extreme, its record low is minus 37 degrees Fahrenheit. Both summer and winter vacationers cherish these inland areas, since they are more quickly accessible for mountains sports than are the higher massifs. Cabins dot the landscape, reflecting rich opportunities for hiking, skiing, fishing, or hunting. In summer, Norwegians come here in search of the elusive and much-coveted wild multer, or cloudberries. Tradition says that if a patch of multer is found, one never tells where it is. The more than 60 percent of Norway which is devoted to mountains and viddas makes way for fertile valleys, which broaden toward the border of Sweden on the east and the shores of the Skagerrak on the south. Yet despite these rolling vistas, only 3 percent of Norway is tillable, with another 25 percent being productive forestland. 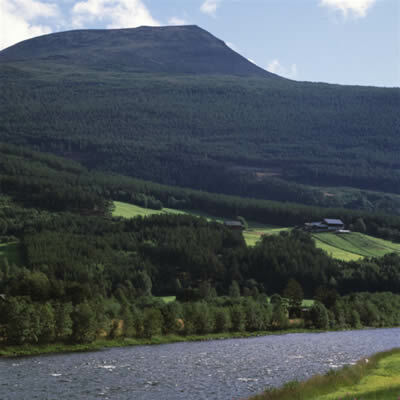 Gudbrandsdal, the most famous of the agricultural valleys-and certainly one of the country’s most beautiful areas-stretches 125 miles south from the skirts of Dovrefjell. 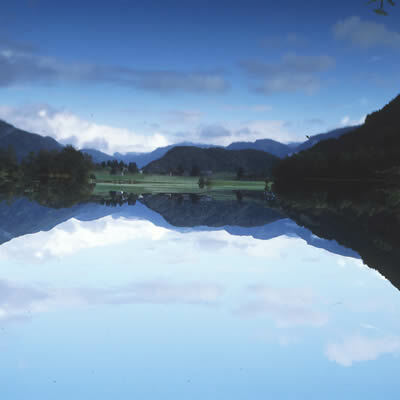 The setting for Ibsen’s Peer Gynt, it is not far from the high fastnesses suggesting the “hall of the mountain king”, so vividly captured in Grieg’s Peer Gynt Suite. Its lush farms and forests are the pride of its inhabitants. 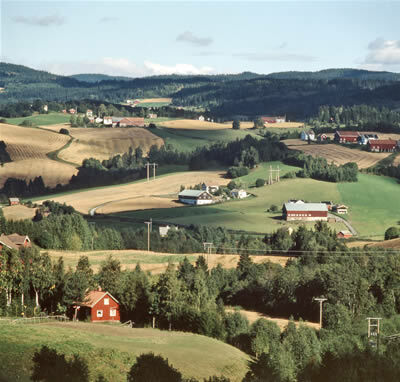 An hour’s drove north of Oslo, the valley of Hadeland provides sites for larger-than-average farms that produce small grain, potatoes, and hay. Large barns house dairy herds and store feed for cattle. By the law of primogeniture, titles to Norwegian farms are passed from one generation to the next. Formerly, the inheritor was the eldest son; today, it is the eldest child, whether son or daughter. At the south end of Gudbrandsdal lies Lake Mjøsa, a long finger of water stretching seventy miles and reaching a depth of 1,453 feet. Norway’s largest lake, for years it has accommodated the steamers used for moving farm products toward their markets in Oslo and beyond. Like its sister lake, Rands Fjord, and others, it is sometimes called a fjord because of its long, narrow shape and its depth-although it is a freshwater lake. A wooden sailboat on the Oslo Fjord follows the tradition of seamanship begun by Vikings over a thousand years ago. Three ships from that period are exhibited at the Viking Museum in Oslo. Since the Viking heyday, Norway’s merchant fleet has grown until today it ranks fifth in the world. In every open space between forests are grain and potato fields, pastures for dairy cattle, and plots yielding hay for winter fodder. Flowing through the timber and farmland of eastern Norway is the Glomma River, the longest in Scandinavia. It takes its rise near the old copper-mining town of Rorøs, provides power and transport for sawmills along its shores, and empties into the Skagerrak and Fredrikstad, east of the Oslo Fjord. Extending northward from the Skagerrak for more than four miles-to the city of Oslo at its inner end- the Oslo Fjord may be less dramatic than the west coast fjords, but it is the channel for ship traffic of every sort going to and from Oslo. 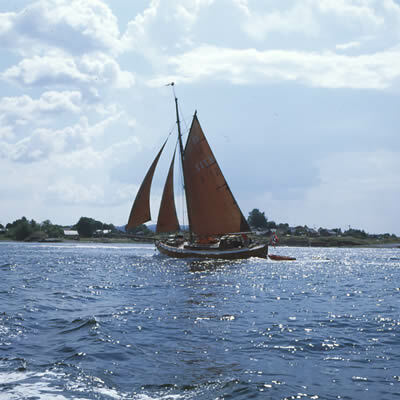 It carries pleasure boats on short jaunts, as well as freighters and ferries headed out to the sea-lanes that provide access to other world ports. Industrial developments, seeking abundant power and accessibility to transportation dot both sides of the Oslo Fjord. On its western shore is Tønsberg, Norway’s oldest city, which was founded in Viking days. 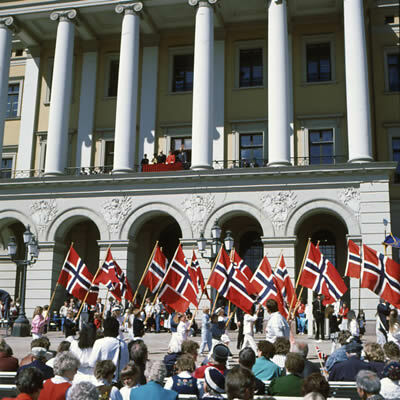 Syttende Mai, the seventeenth of May, is Norway’s national day. In 1814, elected representatives met in Eidsvoll and adopted a constitution establishing a government for an independent Norway. Parades mark this day in many communities, with the most spectacular in Oslo. King Olav V, Crown Prince Harald, Crown Princess Sonja, Princess Martha, and Prince Haakon return the greeting of the marchers. Oslo, Norway’s capital is the nation’s center for government, commerce, and cultural life. It is a city of one-half million inhabitants, with nearly that many more in contiguous communities. In the central city is the Palace, the Parliament building, and-on the brow of the fjord-Akershus castle, a historic old fortress. City Hall, a distinctive modern building facing the harbor, was begun before World War II and completed later. One of the many examples of Norway’s legendary resistance movement during the Nazi occupation was the consistent frustrating of Nazi attempts to complete the construction. Oslo is at once very modern and very old. New buildings, both completed and in progress, coexist charmingly with three- and four-story walkups on an intricate maze of streets. Visitors often remark on the cleanliness of the capital, as well as of virtually all of Norway. The natives tend to be good housekeepers even outdoors. They also blend a contemporary lifestyle with and active appreciation of their roots. Oslo is the hub for both mountainous recreational paradises and bucolic homesteads. The railway system, with is ultra-modern cars and reliable service, radiates out the city on nearly three thousand miles of track, less than one quarter of which in on level ground. Norwegian trains pass through 775 tunnels Andover three thousand bridges. Snow clearance, even in the most difficult settings, is superb. As Norwegians themselves say, “You can always go by train”.